Here’s an interesting topic for thinking: can something as simple as a working desk affect the quality of work you do? And if it can, to what extent? While sitting behind the cash-counter on my work place and trying not to scream because of the pinching needle sensation in my spine, I was wondering if I could do my job standing – I would do a lot more and be far more efficient. But then again, I’d also want to be able to sit once in a while, after all, it’s an 8 hour job of processing transactions – attention should be at high levels. That being said, I took the challenge to search for a suitable solution. Someone, somewhere must have thought of something regarding this matter. It can’t be just me suffering from too much seating in the vast corporate world! And there it was: a height adjust desk. Ah, even the name sounds amazing. It’s the most convenient solution for people who have to sit for 8+ hours a day. Sitting for long hours is just wrong from all aspects: health, body figure and mental alertness. You start to lose your mind after sitting for a few hours because blood circulation is poor and oxygen reaches the brain slower. The height adjust desk is the invention to solve this problem; it has a rather simple design built on one very smart concept: height adjustment. You can lift the working surface up and adjust it according to your needs. These look pretty much like ordinary desks but they do come with some limitations that need to be considered, such as the amount of weight that the desk could hold up. You can’t put too much weight pressure on the working surface because the height adjustment system may suffer, or worst case scenario: not be able to withstand that weight and crash down. The benefits however, are amazing. Whether you’re working in a laboratory, on a cash-counter, or in an office in front of a computer, you’re bound to sit. And just when you want to be standing for a while, you can simply lift your desk and keep working. Lab people reap even more practical benefits from a height adjust desk as their work on microscopes often requires them to stand, and if the microscope is lower than their bended position, their back is going to suffer severely. If you’re able to stand up every hour or so and get your blood flowing, even do a few dance moves if you want to, I bet your performance would get a lot better. If you search for the table online, you’ll find a number of retailers that offer the possibility for you to find the exact sit-stand solution for your needs. 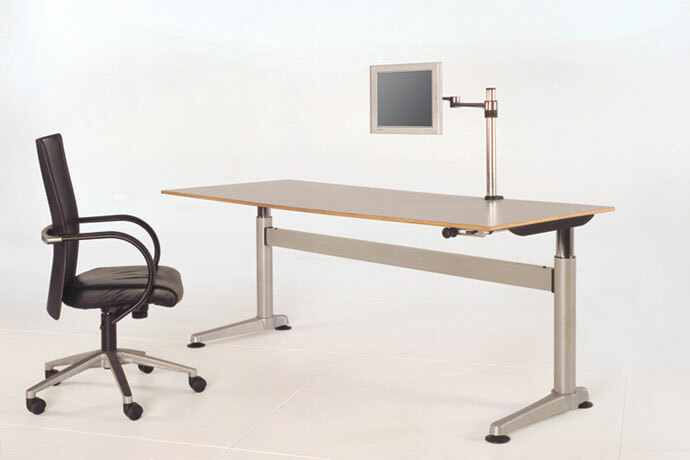 Moreover, some of them offer the possibility for a custom-made height adjustment desk which is very convenient for people with specific tastes. That being said, when are you getting your height adjustment desk?